Light Emitting Polymers are man-made plastics that emit light (fluoresce) when a current is passed through them. LEPs where discovered by chance in 1990 by researchers at Cambridge University who were trying to make make semi-conducting polymers that might replace expensive single crystal silicon¹. 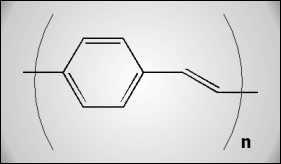 A thin layer of PPV [poly(phenylene vinylene), see figure 1] was applied over [a large area cathode]. When a potential difference was applied across the film not only did it carry a charge, but it glowed with a low-intensity green-yellow light. Soon afterward, Cambridge Display Technology Ltd. was founded with funding from Cambridge University with the goal of studying and eventually marketing LEP technology. CDT has patented some of the technology and continue to develop it further with the end goal of applying it as a mass-market display technology. Figure 1: the stucture of PPV. View using Chime plugin. The Applications of LEPs - learn about the exciting applications for this new technology. The Chemistry of LEPs - learn how LEPs conduct electricity and how this results in fluorescence. The Development of LEPs - learn how the technology of LEPs has developed since its discovery. The Future of LEPs - learn about the state of the LEP industry now and how things are set to progress in the near future. To continue, go to The Applications of LEPs..